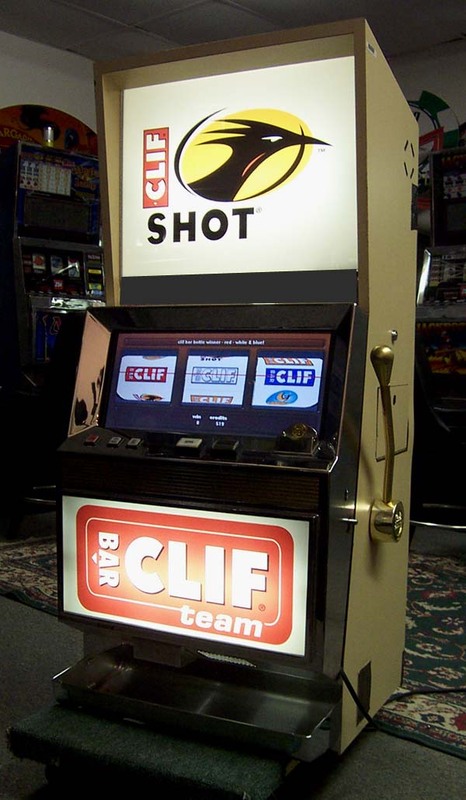 Trade Show Slot Machine Rentals! Call Today for more information about how we can build a custom prize slot machine for your booth or Trade show Exhibit. Casino Games for all of your Casino night and casino party needs. Everything for your event including craps, blackjack, roulette, poker and more! 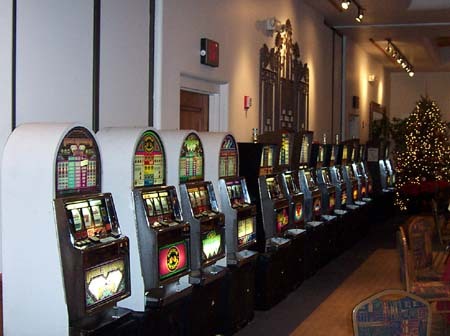 We have the slots you want to rent! 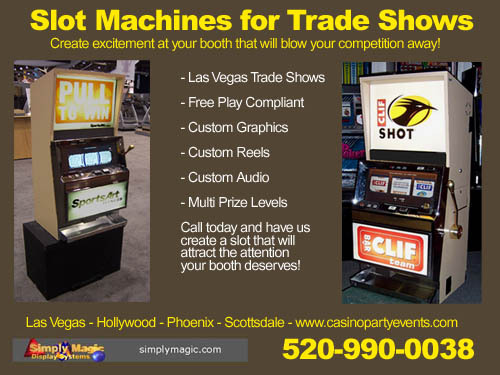 Our promotional prize slot machines will make your trade show booth exciting! Available at Las Vegas conventions - reserve yours today! 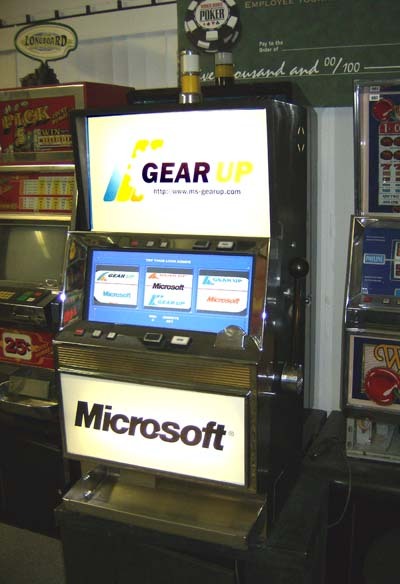 Rent our Dynamic Promotional Slot Machine for your next Trade Show in Las Vegas! Local delivery to the Las Vegas Convention Center, The Sands Expo Center, Mandalay Bay and other Convention locations in Las Vegas. 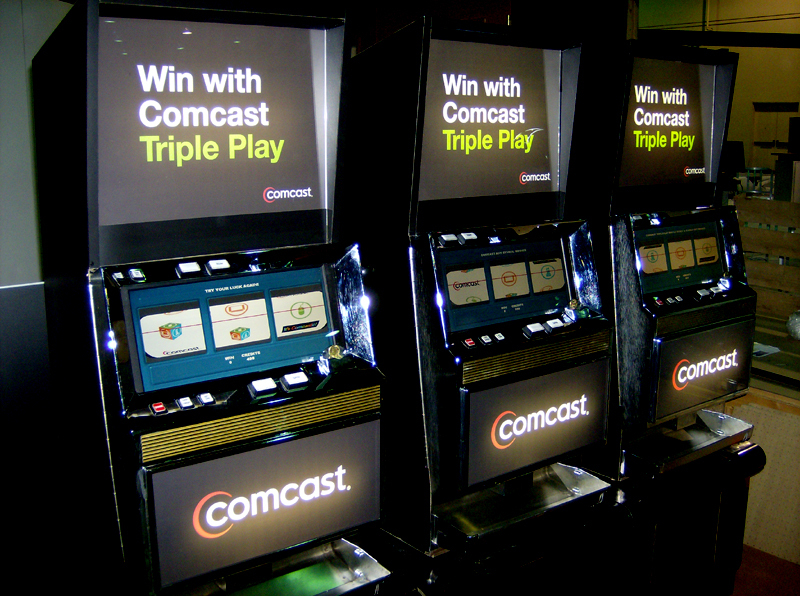 Three of our custom promotional slot machines at the Apartment show held at the Mandalay Bay in Las Vegas. This Slot Machine Game demonstrates how Simply Magic can customize a slot machine for your company. Approx 4MB - Demo requires Windows ME/XP, and Sound Card. This is a demo program to show you the way the slot works. After you download the program and click the LuckySlot file it will set the display into a video game mode and your screen may flash a few times while it changes resolution. Most computers that are 3 years old or less should require no extra files to run. Download to your desktop or a folder. Double click LuckySlot.exe to start. Spacebar spins the reels and the letter Z gives game details. Hit ESC to exit. Game will do about 50-100 demo spins before having to restart it. Regular Slot machines BELOW are not allowed at Trade shows in Nevada or California - See our customizable slot machine above. Neon Wire, EL Wire, Neon Sign, Supply, Rave, Fun, Dance, Light, Genuine, Gem, Ruby, Sapphire, 1969, Enduring, Freedom, USA, Flag, Corvette, Stealth, B1, B52, Inverter, Car, kit, Neon, car, Kit, Car, Accessories, Vegas, Atlantic City, Reno, Casino, Resort, casino night, casino party, casino events, casino christmas party, Phoenix, Mesa, Scottsdale, Glendale, Tempe, Chandler, Prescott, Peoria, Sedona, Yuma, Apache Junction, Gilbert, Surprise, Sun City, Casa Grande, Cave Creek, Florence, Fountain Hills, Globe, Payson, Prescott Valley, Quartzsite, Safford, Show Low, Sun City West, Wickenburg,green valley, Nogales, Benson, Bisbee, Anthem, BXI Trade"